My daughter had thirds of this cauliflower, pea and edamame macaroni and cheese! It is a springtime vegetarian casserole that the whole family will love. 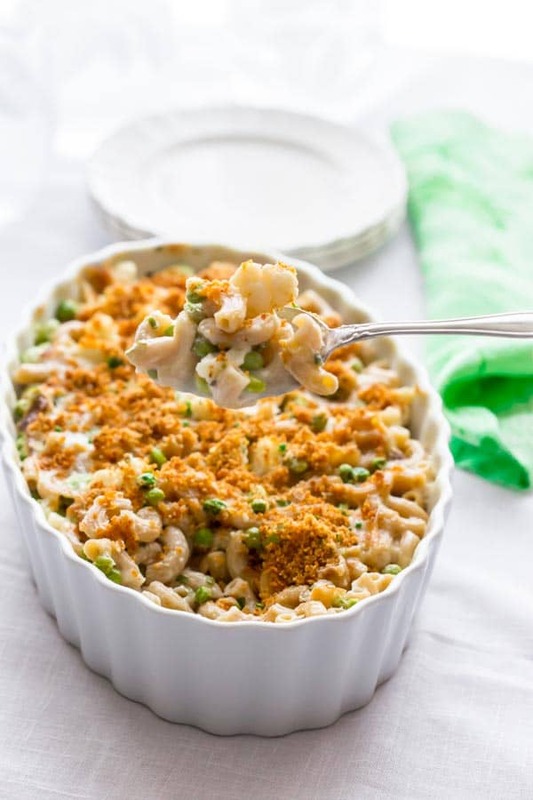 The cheesy macaroni is baked with crunchy breadcrumbs on top and is studded with cauliflower, peas and protein-packed edamame. Who doesn’t love healthy macaroni and cheese? Has it really been since 2012 that I posted a macaroni and cheese recipe? That’s a little out of hand considering that people tell me the broccoli mac and cheese here on healthy seasonal recipes is one of their family’s favorite go-to-again-and-again recipes. 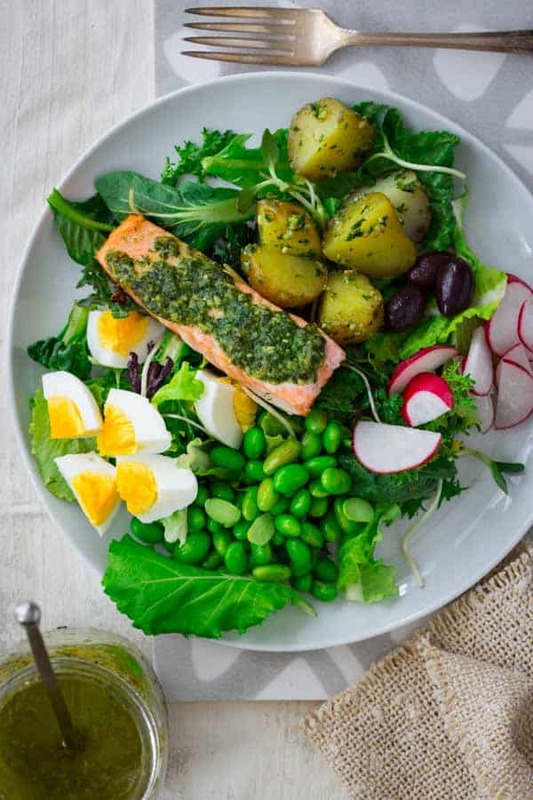 As a mom, I get it, as much as I brag about my kids being adventurous Brussels sprout devouring eaters and that they love to eat lamb and salad, mac and cheese happens a lot around here too. My daughters request mac and cheese all the time. They even order it when we go out to eat. I even stock boxes of it for the sitter for the rare occasions that Jase and I go out. (Take that Captcha, I am not a robot.) What can I say? It’s a classic. Use the best cheese. For me that means usually I go for sharp cheddar. Duh. Sometimes I add some Parm in for an added kick or occasionally I will go wild and add in some Gruyere or something. My theory though is to use sharp cheese, which has the strongest flavor, so you don’t have to use so much. Cheese is about 110 calories per ounce, so it’s best to keep the ratio of cheese to around an ounce per serving of macaroni and cheese. I add in vegetables for bulk and added nutrition. Usually, I add in frozen veggies because they are so easy. When the kids were toddlers I used the frozen mixed veggies because they loved them and I loved that they were already small enough that I didn’t have to worry about choking hazards. Broccoli and cauliflower taste great with cheese so they are a no-brainer and often make their way into the pot. In the summer, chopped zucchini is a great quick cooking vegetable to add too. In the fall I love Brussels sprouts and winter squash too. To tenderize the veggies a bit before they hit the sauce, I like to add them to the boiling pasta in the last two minutes of cooking; you save a step of cooking them separately. I use whole-grain pasta. Any shape works. I am partial to classic macaroni myself. But last night I retested this recipe with rigatoni and my kids and Jase said they liked it even better. So use what you like, I’ll let you decide. Choosing a whole grain means more fiber which is better for your gut and keeps you fuller longer. I use fat free milk to make the sauce and thicken it with a flour slurry. I save calories by not making a roux with butter, and that gives me more leeway in the cheese allowance. Just 1 tablespoon of butter has about the same calories as a quarter cup of shredded cheese. I’d argue that the cheese will give you more flavor, so I skip the butter entirely and choose more cheese. Plus the slurry method is so easy. The trick to making a lump free sauce is to heat up most of the milk until it is steaming. Then whisk a little cold milk with the sauce seasonings and flour on the side. That’s called a slurry. Whisking the slurry into the steaming milk before it boils, and then whisking it more as it comes up to a boil ensures smooth results. Then take that thickened sauce off the heat and add in the cheese. It will melt right into the sauce. I add a touch of Dijon mustard, garlic powder and white pepper to boost the flavor of the cheese without adding extra calories. You’ll need to do a touch of math to cook the pasta and vegetables just right. Here’s why, the pasta and vegetables cook in the boiling water one time. Then they cook again in the cheese sauce in the oven. So you will want to cook the pasta in boiling water less than the package says to by about a minute. It will still have a bite to it. But then it will soften completely in the sauce. You also will need to throw the veggies into the pot in the last two minutes of cooking. So if the package says cook pasta for 9 minutes, set your timer for 8 minutes and then keep an eye on it. When there are two minutes left, throw in the veggies. Make sense? When I was a kid, I would covertly stand at the counter-side and pick all the crusty pieces off the top of the baked macaroni and cheese. I mean, is that the best part, or what? So I like to add on some added crunch with some breadcrumb topping. I stir dry breadcrumbs with a touch of oil and paprika. The paprika turns it a nice orange color. 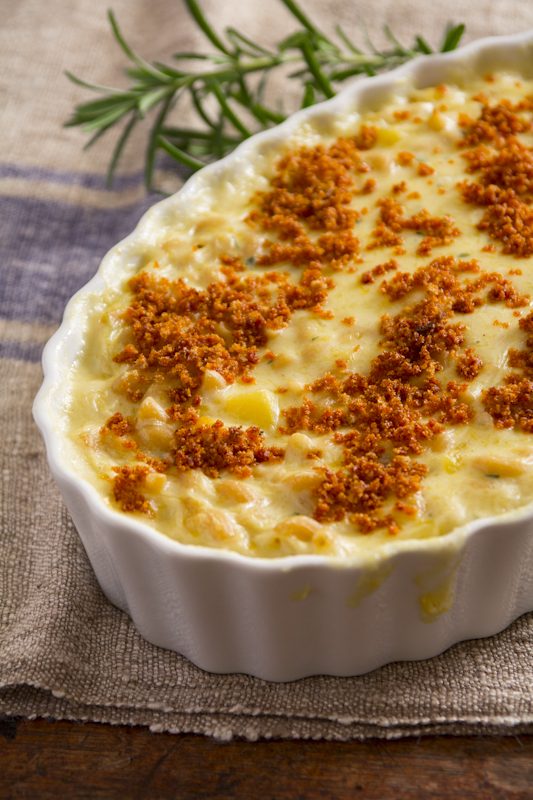 What are your favorite cheeses and vegetables for macaroni and cheese? Do you buy boxed macaroni and cheese? Are you glad to know I am not a robot? 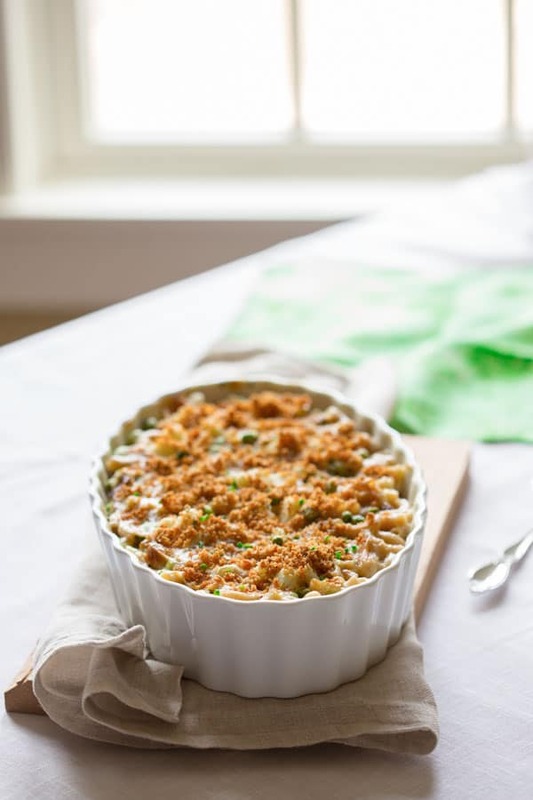 Who knew you could do it, but leave it to the amazing Carolyn of All Day I Dream About Food to figure out a way to make Low Carb Mac and Cheese with bacon and English Cheddar, oh my! Light Sweet Potato Mac and Cheese from Dara at Cookin’ Canuck. 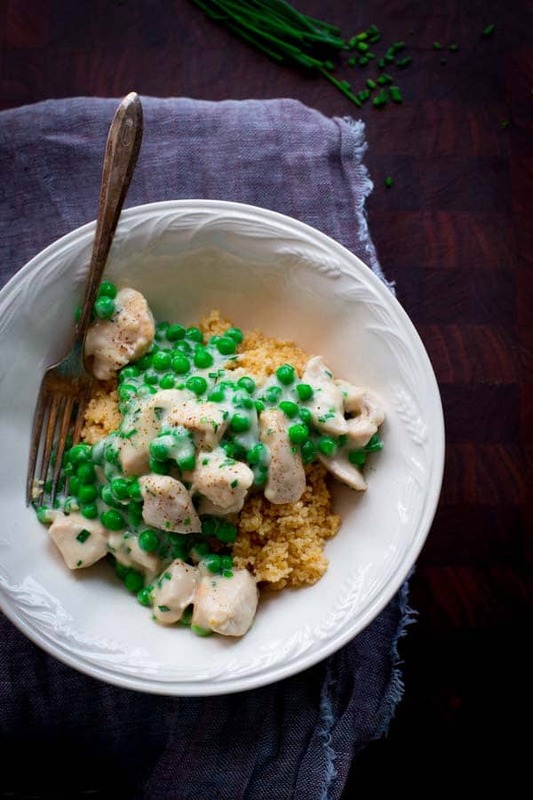 Want more ideas for cauliflower? Don’t miss this Ultimate Guide to Cauliflower! 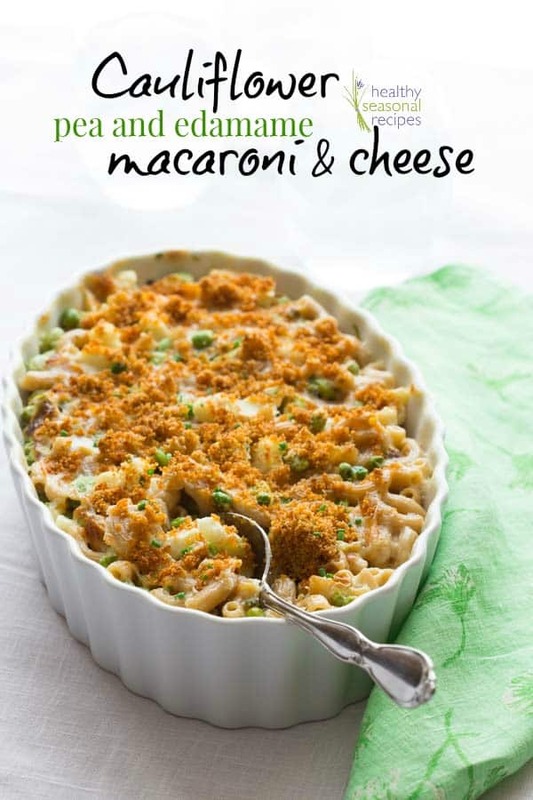 A healthy macaroni and cheese recipe for the springtime! 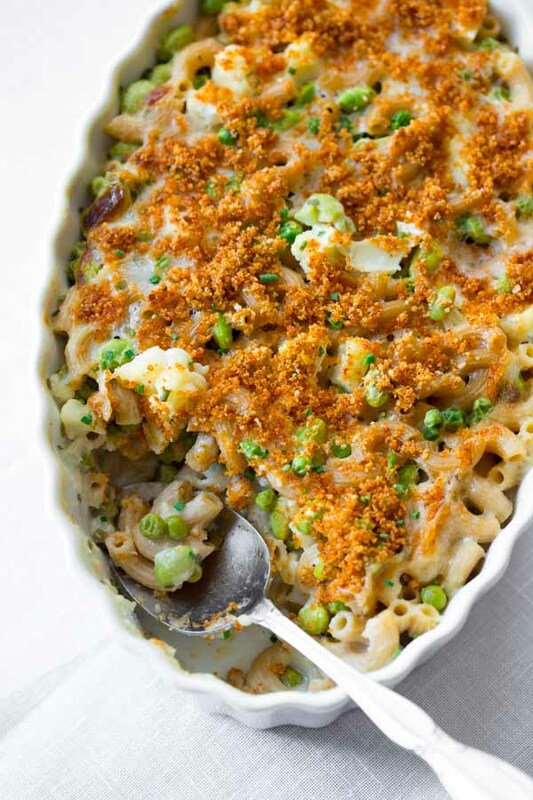 With cauliflower, peas and edamame and crunchy breadcrumb topping. It is made lighter with non-fat milk and no butter, but there is still plenty of flavor! Coat an 2 ½ quart baking dish with cooking spray. Preheat oven to 400 degrees F. Bring a large pot of lightly salted water to a boil. Meanwhile, heat 2 ¼ cups milk in a medium saucepan over medium heat until steaming but not simmering. Whisk the remaining ½ cup milk, flour, Dijon, 1 teaspoon salt, garlic powder and white pepper in a small bowl. Whisk the flour mixture into the steaming milk, and continue heating, stirring often, until the mixture thickens and bubbles, about 4 minutes. Remove from the heat and stir in cheddar and chives. Stir until melted and smooth. Stir pasta and cauliflower into cheese sauce. Transfer the pasta to the prepared dish (it will seem very loose.) Mix breadcrumbs, oil paprika and the pinch salt in a small dish. 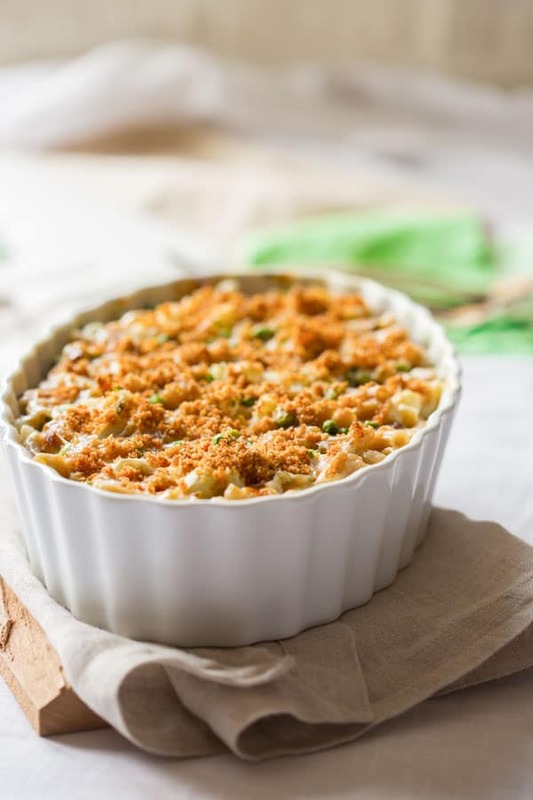 Top macaroni with the breadcrumb mixture. 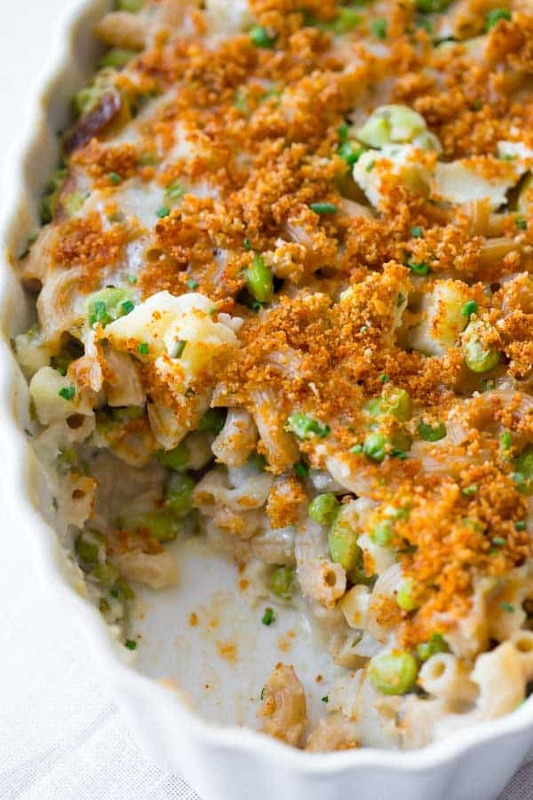 Transfer to the oven and bake until bubbling and the breadcrumb topping is golden, 18 to 22 minutes. Let sit about 10 minutes to cool before serving. Total time includes 10 minutes of cooling time. What? 2012 is the last Mac n Cheese recipe. How can that be???? Love this recipe! Gorgeous and looks like it would taste UHMazing. I know, crazy right?! Thanks so much my dear. yummy! This looks so delicious! I love adding veggies to my mac n cheese! Me too! It is so easy to add in, and adds so much nutritional value to a vegetarian meal. 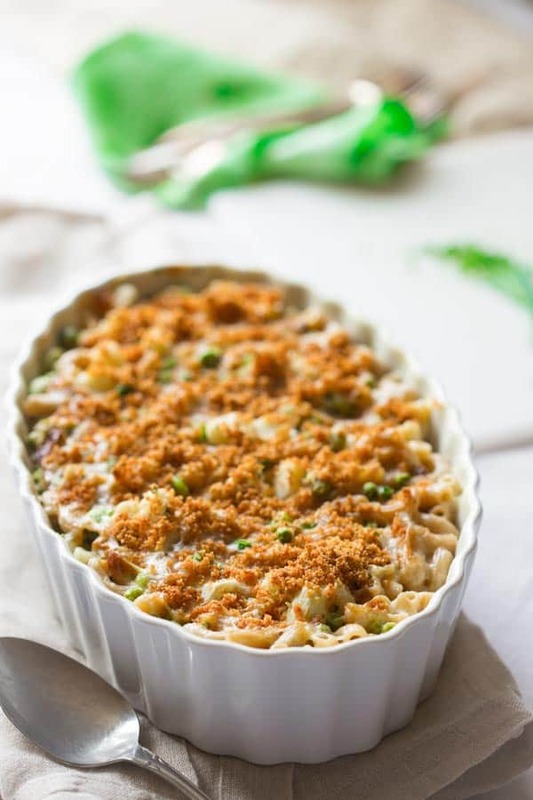 Green veg with mac and cheese is such a perfect combination! I like to put broccoli in ours, but I’m definitely going to have to try the edamame and pea version too. 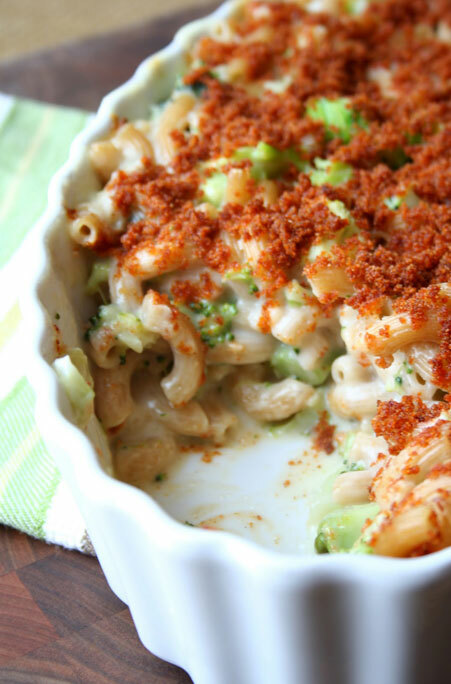 We love broccoli in mac and cheese too. I especially love to use the easy frozen chopped broccoli for busy weeknights. I love it when that happens! And glad to give you one. It always amazes me that you can figure out how to make everything low-carb. 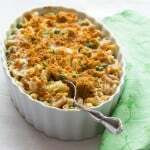 I’ll admit I DO make boxed mac n’ cheese [Annie’s and Horizon] BUT having said that your version with the added veggies [cooked in the pasta water–win win] is definitely on my list to try. Pinning for an easy, comforting weeknight meal 🙂 And can you please help me get my son to TRY lamb?! Your daughter would be a good influence on him lol! Katie, Gad to hear I am not the only one in the healthy blogging community that resorts to boxed mac and cheese once in a while. And the lamb thing totally surprised me too. I just offer them the food in a neutral way and sometimes they love it. If they don’t I ignore it, and keep feeding it to them (or just put it on their plate) over and over again until eventually they like things. I know you know the whole 9 exposure thing and that is totally the system I use. I dont make a special meal for them. It is a proccess, don’t let it get to you. He’ll catch on eventually especially if he see’s Mommy enjoying it. Katie I love this recipe, not only does it look incredible but your tips are SPOT on. Never thought to toss veggies into boiling pasta for the last 1-2 minutes, that is really a genius move! And I couldn’t agree more about using extra sharp cheeses + FF milk, it’s the only way to keep things indulgent but still guilt-free. Pinned! Yay! So glad you agree. Thanks so much for pinning. What an honor. I hope your guests enjoy it! Ok, you’ve outdone yourself with this recipe, Katie! I don’t allow myself to have mac and cheese much because it seems like such an indulgence. I love how you lightened up this version and put in lots of veg! Exactly! Thanks so much my friend. All of my family loves macaroni and cheese! No judgments – I admit to buying the boxed variety for quick meals. My favorite add in is broccoli. My granddaughter’s favorite way is with ham and peas. And what’s not to love about the lobster mac & cheese you get in Maine! Edamame looks like a great add. Yum to mac & cheese, anyway you can make it! This looks great, think it’s dinner for tonight. Just one question. I don’t know whether I’m just missing it but I can’t see a calorie count for this rescipe. Hi Jane! It looks like this one wasn’t’ analyzed yet. I have a nutrition intern who is making her way through all of the archives and adding in the stats. In the meantime, I went ahead and did it so you wouldn’t have to wait. See in the recipe above! And in the future if you run into that issue again, I highly recommend using the “My Fitness Pal” website. It is free, and you just plug the url of the recipe into their analizer to get the results! Super helpful and easy! Please stop back and let us know how the recipe came out.